Risk appetite held firm with optimism over a potential US-China trade deal. Global equities traded close to 6-month highs. Demand for defensive currencies weakened and the Euro managed to regain some ground on Friday as German yields increased. The dollar was little changed ahead of the jobs data with slight losses as commodity currencies rallied from Thursday’s intra-day lows. Sterling was hampered by a lack of positive Brexit developments, but recovered from lows on reports of a potential long Article 50 extension. Oil was hit by profit taking and a correction after Brent failed to break $70.0 p/b. Gold dipped sharply to 4-week lows before staging a strong recovery to trade little changed. Euro momentum stalled after the much weaker than expected reading for German factory orders and the currency failed to regain momentum ahead of the New York open as underlying growth concerns returned. The weak German data also had a negative impact on global growth expectations which undermined commodity currencies and underpinned the US dollar. Minutes from the ECB’s March meeting stated that some members wanted to extend guidance for zero interest rates until at least the first quarter of 2020. Most members still expected current weakness to be a soft patch, although uncertainty was elevated. There was also a risk that the slowdown in growth could weigh on the pass-through from wages to prices. US initial jobless claims declined to 202,000 in the latest week from 212,000 previously and the lowest reading for over two months which continued to suggest a strong labour market. The Challenger survey recorded a decline in March job cuts, although the first-quarter total was the highest since the third quarter of 2015. With a lack of positive Euro factors, EUR/USD retreated to near 1.1200 before a slight recovery as commodity currencies stabilised with the dollar retreating slightly from 3-week highs. Relatively narrow ranges prevailed with caution ahead of Friday’s employment report given the potential for significant volatility after last month’s very weak increase in non-farm payrolls. EUR/USD traded around 1.1230 with some relief that German industrial production increased slightly as German yields moved higher. Following overnight gains, US Treasuries gradually lost ground ahead of the New York open with the 10-year yield holding above 2.50% which supported the dollar. President Trump stated that the US economy was strong despite destructive actions by the Federal Reserve. Cleveland Fed President Mester stated that her bias was for keeping interest rates unchanged or moving them slightly higher despite the downside risks. Trump also announced that Herman Cain would be nominated as a Fed Governor which triggered another round of uncertainty over medium-term Fed policies. Although Wednesday’s House of Commons vote should further reduce the risk of a ‘no-deal Brexit outcome, markets were uneasy over a lack of progress in finding any solution to the Brexit impasse ahead of the emergency EU Summit meeting next week. The government held another round of meetings with the Labour Party it was also reported that a confirmatory referendum was under consideration, but with no breakthrough while internal party tensions remained extremely high. Sterling was also hampered by a slightly softer tone in oil prices and GBP/USD weakened to lows around 1.3060 while EUR/GBP hit resistance on approach to 0.8600. Source reports indicated that EU Council President Tusk could propose a flexible 12-month Article 50 extension. Although there were concerns that any long extension would prolong economic uncertainty and delay investment, any easing of the immediate crisis phase would potentially be a positive factor. 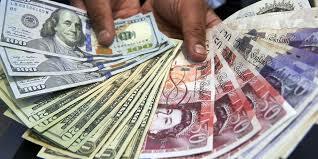 GBP/USD recovered to just above 1.3100 while EUR/GBP dipped to around 0.8570 with further choppy trading likely. The Swiss franc weakened slightly during Thursday with markets looking to take a slightly more optimistic stance on the global outlook. The persistent National Bank warnings over potential intervention also had some impact in curbing franc demand. EUR/CHF advanced to the 1.1220 area while the dollar edged just above parity, although narrow ranges prevailed. Franc demand remained slightly weaker on Friday as risk appetite held firm, although USD/CHF was still unable to sustain a break above parity. Global equity-market gains slowed during Thursday and there was a slightly more cautious attitude towards global growth. In this environment, AUD/USD declined to lows just below 0.7100 before a slight recovery. Optimism over US-China trade developments had a positive impact on risk sentiment with AUD/USD advancing to around 0.7125 on Friday. The Canadian dollar was hampered by fresh doubts over global growth conditions while oil prices edged lower. The Canadian PMI index strengthened to 54.3 for March from 50.6 which provided an element of support, although the Canadian dollar failed to make headway. Overall, USD/CAD pushed to highs around 1.3370 before fading slightly and consolidating just above 1.3350 ahead of Friday’s jobs report. There was choppy trading in the Norwegian krone during Thursday with little overall change in Europe as EUR/NOK consolidated around 9.6350. The krone did lose ground later in US trading as oil prices declined with EUR/NOK advancing to the 9.65 area. The currency was little changed on Friday as a dip in industrial production curbed support, although USD/NOK hit resistance close to 8.60. Swedish krona sentiment remained slightly stronger with EUR/SEK dipping to test support below 10.40 before consolidating just above this level with USD/SEK around 9.26. Euro-zone equities were hampered by renewed concerns over the global growth outlook following weak German data with lower Italian growth forecasts also a negative factor, although global sentiment provided support. Overall, the Eurostoxx 50 index advanced 0.2% despite a 0.2% decline in the Italian FTSE MIB index as the German DAX index hit 8-month highs. Major UK stocks secured protection from a weaker Sterling tone, but domestic political uncertainty also weighed on sentiment with the FSE 100 index declining 0.2%. Trade optimism underpinned US equities, although there was caution ahead of the jobs report. In choppy trading, the S&P 500 index gained 0.2%. There was mixed trading in Asia on Friday with Chinese and Hong Kong stocks closed for a holiday. Japan’s Nikkei 225 index gained 0.35% as the dollar held a firm tone, but the Australian ASX index declined 0.8% as domestic sectors came under pressure. Oil prices were hampered during Thursday by fresh doubts over global demand conditions. A firm dollar also curbed support with pressure for profit taking from 5-month highs also a feature. There was still underlying support from supply concerns and expectations that demand would increase now the refinery maintenance season has been completed. There was choppy trading in New York with Brent rebuffed at the important $70.0 p/b level and retreating to around $69.20 while WTI hit resistance close to $62.80 p/b. WTI stabilised just above $62.00 p/b on Friday ahead of the US data with Brent around $69.20 p/b..
Gold was undermined by a firm US dollar and dipped sharply in early New York trading with losses to 4-week lows below $1,283 per ounce. There was, however, a quick recovery back above $1,290. Cain’s nomination to the Federal Reserve helped support gold given that he is an advocate for a gold standard. Gold stabilised just below $1,290 on Friday with silver near $15.10 per ounce after a brief dip below the key $15.00 level on Thursday. Data reported that overall cryptocurrency trading volumes declined to a 2-year low in March, increasing the risk of price spikes on a lack of liquidity. Bitcoin was unable to hold above the $5000 level in Europe on Thursday and retreated steadily after the European close to below $4800. A recovery in gold curbed potential demand for cryptocurrencies and bitcoin stabilised just below $5000 on Friday. Ether found support well above $150 and traded around $165 on Friday.